Adeno-Associated Virus(AAV)는 분열하거나 분열하지 않는 세포 모두에 감염시킬 수 있는 non-enveloped의 single stranded DNA virus이다. AAV는 helper virus가 존재시에만 복제가 가능하며 인간에게는 비병원성이다. 이런 특징으로 다양한 세포에 유전자를 도입하는 유용한 방법이며 유전자치료를 위한 유용한 vector로 사용되고 있다. 중추신경계, 간, 망막 등에, AAV6는 심장, 근육, 간 등에 대한 유전자 도입효율이 높다고 알려져 있다. 다카라에서는 Serotype 1, 2, 5, 6의 AAV vector를 helper virus없이 안전하게 제작하기 위한 AAVpro Helper Free System을 판매하고 있다. 본 제품으로 만들어진 AAV 바이러스 입자를 이용하여 표적 세포나 동물 개체에서 목적 유전자를 일시적으로 발현시킬 수 있다. AAVpro® Helper Free System은 helper virus를 사용하지 않고, 고역가의 AAV를 제작하는 시스템이다. 본 제품에 포함된 3종류의 플라스미드를 HEK293T 세포에 도입하여 간편하게 AAV입자를 제작할 수 있다. 최소화하며, 간편하게 AAV vector입자를 추출할 수 있다. 추출시약은 System 제품내에 포함되어 있으며, AAVpro® Extraction Solution (Code 6235)으로도 판매하고 있다. 또한 고효율의 in vivo 유전자 도입을 위한 AAV 정제에는 AAVpro® Purification Kit (All Serotype) (Code 6666) 또는 AAVpro® Purification Kit (AAV2)(Code 6232)를 이용할 수 있다. 그림 1. Preparation of AAV2 particles using the AAVpro Helper Free System (AAV2). HEK293T cells are co-transfected with the three plasmids (pHelper, pAAV-CMV, and pRC2-mi342) that encode all of the components necessary to product recombinant AAV2 particles. 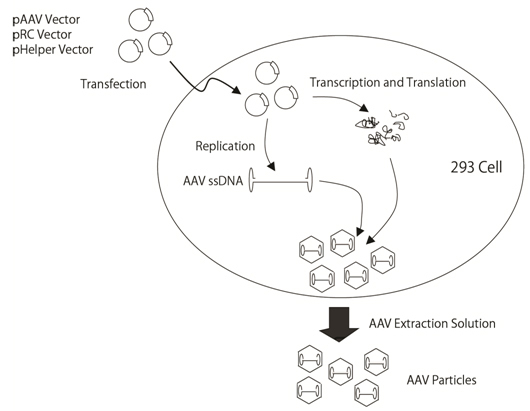 After transfection, particles can be extracted using included AAVpro® Extraction Solution. 그림 2. Effect of miRNA-342 on AAV2 titer. 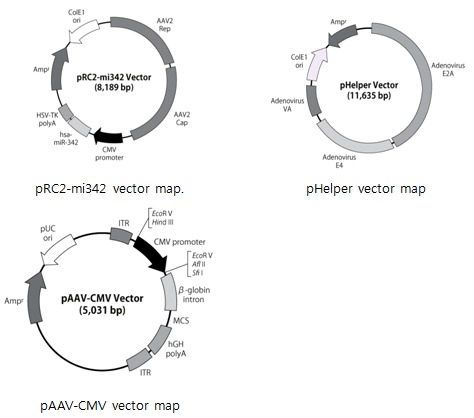 HEK293 cells were transfected with the three plasmids in the AAVpro Helper Free System (AAV2). AAV2 particles were extracted from virus-producing cells either expressing hsa-miR-342 (pRC2-mi342) or not (pRC2). 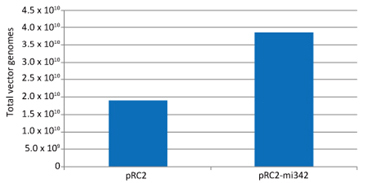 Viral titer was evaluated using real-time PCR (total vector genome; vg). Expression of hsa-miR-342 in this system resulted in a two-fold increase in titer as compared to cells that did not express the microRNA. *1 pAAV-CMV Vector에 삽입할 목적유전자의 사이즈는 ~2.5 kb 이다. (Code 6651)에는 pRC6 Vector이 포함되어 있다. (Code 6665)에는 pRC6 Vector이 포함되어 있다. Helper Free 시스템에 의한 다양한 serotype의 AAV ..
Cre-Recombinase 유전자를 탑재한 AAV1, AAV2, AAV5..
β-galactosidase 유전자를 탑재한 AAV1, AAV2, AAV..